­“Hey, that was a good run!” the person who’d been riding behind me down the Hudson River Greenway on Friday evening shouted to me. He’d cycled on my tail from 34th St, as I returned from giving a television interview about Scotland’s independence referendum, down as far as Warren St. Every time he’d come close to my rear wheel, I’d sped up a little and we’d done a steady 18mph – 19mph for three miles. “Safe ride home!” my travelling companion yelled as I turned off the path towards the Brooklyn Bridge and he continued on south. Yet, on Friday, instead of feeling pleasure at the excitement of an enjoyable, fast-ish ride by the river, I felt a sharp stab of guilt. What if I’d been irresponsible? What if I’d been riding so fast that I’d have hit a pedestrian stepping onto the path? Did I risk running into one of the many stray runners on the cycleway? I felt the guilt in the aftermath of a crash in Central Park on Thursday afternoon in which Jason Marshall, a cyclist on a fast training run round the park, hit Jill Tarlov, a 59-year-old woman from Connecticut who was crossing the road in front of him. Although she was on life support on Friday, she has since, very sadly, died. News of the crash had left me with an acute sense of my responsibility towards other road users. I also anticipated – correctly – new calls for a crackdown on the menace of “killer cyclists”. As I was speeding down the Hudson River Greenway, I was feeling a strange mixture of unjustly put-upon and guilty over my complacency about the risks cyclists pose to others. Did I need to change the way I rode to ensure I kept other road users safer? Would everyone now assume I posed a deadly risk to them, just because one other cyclist had been involved in a high-speed crash? The big challenge in understanding events like Thursday’s crash is precisely that they’re extremely rare, whether in New York, London or anywhere else. Thursday’s crash is the second fatal pedestrian-cyclist collision in New York in recent months – a crash with a 17-year-old cyclist, also in Central Park, killed Irvin Schachter, 75, in August. But the last fatal bike-pedestrian crash before that was in 2009. There have consequently been three pedestrian fatalities in bike crashes over a six year period when crashes involving motor vehicles have killed more than 1,500 people. A competing challenge is that people get away so often with risky behaviour that nearly everyone is confused about which behaviour actually poses a risk. Motorists who drive down urban streets at 50mph or more seldom encounter a pedestrian unexpectedly stepping out from a kerb or a motorist unexpectedly in an intersection. They can consequently lapse into thinking that 50mph is a safe speed on an urban street. The speed’s effect on their stopping speed and the vehicle’s higher momentum nevertheless make it profoundly unsafe and deadly when something unexpected does occur. Cyclists racing round Central Park – or Prospect Park, near my apartment – grow so used to dodging successfully round pedestrians that many must assume there’s little risk in doing so at the 25mph and higher speeds that I see many going. Many leave far too little margin for error. To confuse matters still further, cyclist and motorist behaviour seems to feel different to pedestrians. 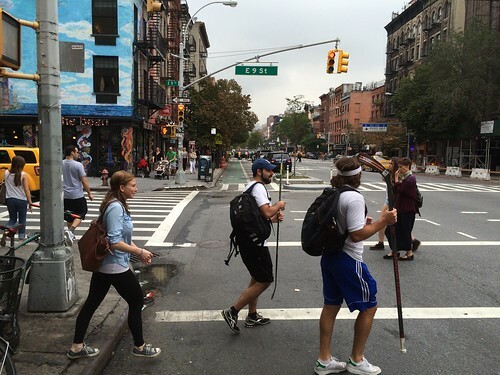 Given that motor vehicles killed 168 pedestrians in New York last year, pedestrians are in some senses constantly at risk from negligent motorist behaviour. Yet the ubiquity of motor vehicles and the difficulty distinguishing the seriously risky behaviour from the less dangerous seem to stop many people from understanding the risk’s scale. Fast-moving, quiet cyclists often take people by surprise, however, even when they’re behaving safely. This seems to lead many to perceive wrongly that the danger from bicyclists – who were involved in no fatal crashes with pedestrians between 2010 and last year – is on a comparable level to that from motorists. near where I worried my 18mph to 19mph speed was excessive. However loud the understandable outcry, the Central Park crash hasn’t undermined the strong moral case for using a bicycle to get about, rather than a car. Cyclists are generally moving more slowly if they collide with people than motorists are. The lower weight of a bicycle and rider compared with a car and driver also reduces the energy released in a collision. I posed less risk to a pedestrian stepping out onto the Hudson Greenway than the scores of cars driving at 50mph, 60mph or more on the neighbouring, speeding-plagued West Side Highway. There might not even, it seems to me as a layman, be a solid case for charging Jason Marshall with a serious criminal offence under New York's shockingly lax road safety laws. Newspaper reports gave lurid accounts of how Marshall “ploughed” into Ms Tarlov. But Marshall seems to have hit her after swerving to avoid other pedestrians and yelling out a warning that she seems not to have heard. He might – might – have been going below Central Park’s 25mph speed limit and doing his best to avoid people crossing the road against the pedestrian traffic signal. New York motorists would generally have to behave with far more obvious recklessness to face serious criminal sanctions. When I rode in Central Park one time recently at a time cars were allowed to use part of the park, few seemed to adhere to the 25mph speed limit. Yet all of these caveats only go to underline the most critical lesson that anyone who ever uses a street for any purpose should take away from Thursday’s tragedy. It’s that everyone’s primary focus should be, as far as possible, to avoid unnecessarily harming others. However solitary one might feel riding a bicycle or driving a car, one’s involved in an intense and complex series of social interactions. The scope for misunderstanding is so vast that it is always imperative to act cautiously. Anyone who’s ridden a bicycle in Central Park, Prospect Park or some other big urban park - like London’s Hyde Park or Regent’s Park - knows that the park’s users are apt to behave far more unpredictably and casually than they would around a normal road. Many are oblivious to the presence of even large numbers of cyclists. On the rare occasions when I go to a park to ride in circles, I try to ensure I pick up speed only when I can be certain the road is clear of obstructions for a suitable distance ahead. Under those circumstances, there can be no moral excuse, it seems to me, for riding round a park so set on achieving a set speed that one is reluctant to reduce speed or make space when passing other park users. To judge by accounts of Jason Marshall’s keen pursuit of records on Strava, the online bike-racing app, his overall, incautious determination to maintain his speed may have been far more culpable than anything specific about his reaction on encountering people crossing the road. It is, of course, apt to sound like a counsel of despair to enjoin road users to behave more ethically towards each other. Many road users struggle to understand rules about yielding when turning and other straightforward road rules. Others display such failures of compassion towards other road users that it’s hard to imagine their taking a truly moral stance. But any of us who thinks seriously about how we use the roads can set an example. I can avoid recklessly swerving into the oncoming lane to overtake slow cyclists in front on the blind bends on the Manhattan Bridge bike path. You can overtake carefully and with plenty of space even the infuriating runners who run down the Hudson Greenway’s bike lanes. I can slow even for pedestrians with the maddening habit of waiting to cross 1st avenue while standing in the busy, hard-to-negotiate segregated bike lane. You can wait until it's safe to pass that pedestrian who's insisting on walking down the narrow, constricted Allen St bike lanes. Even on Friday evening, despite my guilt pangs, I had, looking back, kept looking carefully for pedestrians and runners and sought to take evasive action in good time when I saw one. I stopped for one crosswalk by the Chelsea Piers and so surprised one waiting pedestrian she took a moment actually to cross. I tried, albeit probably imperfectly, to live up to my moral principles. It is, after all, the central tragedy of traffic in New York City and many other big cities that so many people walking and cycling – using the least harmful transport modes – end up in cold mortuaries and warm intensive care units. It’s a horror that’s no less intense for being widely taken for granted. I will do everything I reasonably can to ensure I’m not responsible for putting anybody else in those places. Well said, Richard. This has been pretty much my take, too. That by the standards for prosecution usually applied in NYC/NYS, Marshall, if he had the light, probably would not be prosecuted. Whatever the status of the light, though, it is almost certain -- with slight but very slim reason to imagine otherwise -- that his behavior was morally repugnant. I've also been finding the Post's coverage of the story -- especially the way that they keep harping that this happened at the intersection of the crosswalk and an auto lane rather than the bike lane, without any apparent realization that use of auto/service lanes by bikes on the drive is completely commonplace and unremarkable -- infuriating, but that is what it is. I didn't have space to get into the whole auto lane thing but it is stupid. The park is closed to motor vehicles at that point and that time, so it's hard to see that it's in any way wrong for cyclists to be in the motor vehicle lanes. The problem comes when people are going too fast or with so little ability to maneouvre that they can't react to unexpected events. 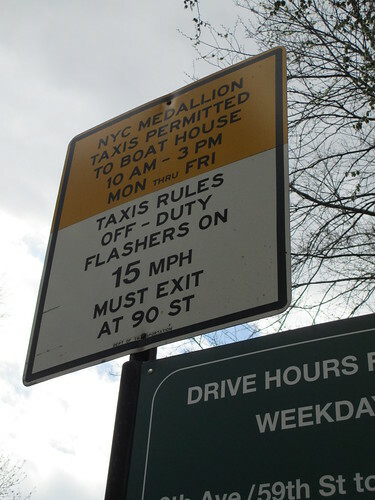 Perhaps a 20mph speed limit for all vehicles in Central Park with zero-tolerance enforcement would make sense. Getting hit by a bike at that speed would still hurt a lot, but it’s far more likely to be surviveable. It would do a lot to increase car safety, too — every stat I’ve seen suggests a big difference between 20 and 25mph crashes, never mind 25mph-as-unenforced-in-NYC. This is of course a half-joke proposal intended to score political points — I could easily live with a 20mph bike limit, and I’m guessing that you could too, but drivers would whinge endlessly. Or perhaps, instead of a speed limit, we could have a kinetic energy limit? 9 meters per second (20.13mph), 100 kilos (220.5lbs) gross vehicle weight, call it 4500 Joules. For me on a cargo bike, 17mph; for 14-year-old me on a racing bike, 21.4mph. And in a 1000kilo car, 6.3mph. Seems fair to me; “laws of physics”, after all. I wouldn't mind a lower speed limit in the park, although I have to confess that once, near dusk, I went 32mph down a hill in Richmond Park in London, which has a 20mph speed limit. 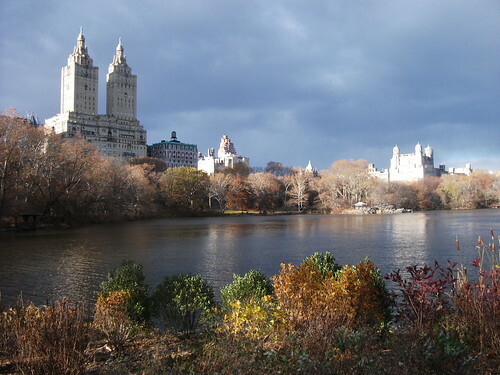 There was no-one about, however, and that park is far more rural in nature than Central Park. The big danger there was that one of the park's deer - which are very big - would wander into my path. Roads policing in the UK is far more focused on broad principles - such as avoiding careless or dangerous driving - and less on the minutiae of exactly what one's doing. That strikes me as a good way forward not just in Central Park but in the whole of these United States. Thoughtful and articulated so much of what I have been thinking since last Thursday. Thank you. This whole business has been very much on my mind. I could not agree more about your criticism of people's poor risk assessment capability. 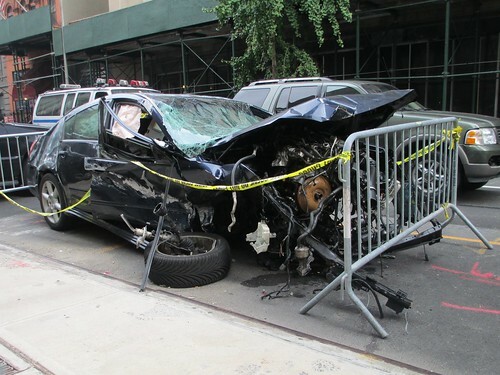 Yes, crashes involving motor vehicles in New York City have killed over 1,500 people in six years. But let's not forget that motorists poison and kill approximately 1,421 people in New York City every year. With children and the elderly being most vulnerable to these lethal poisons. In terms of any form of rational risk analysis, even the most irresponsible of cyclists is looking like an angel in comparison to car drivers. I just plain do not understand how someone can launch a lethal cancer poison attack upon innocent children by driving a car in a densely populated city. Your comment is particularly timely in United Nations week, when the whole world comes together to remind us of the irrationality of seeking to drive a motor vehicle in New York City. Few motorists brag on Strava how fast they went through crowded parks on a vehicle (triathlon bike) that has poor maneuverability. The rare idiot that brags about it on places like Facebook usually suffers consequences. 1. Strava is pretty passive. You turn it on; it records. I don't think you can tell by someone's Strava feed how interested he or she is in beating records on particular segments. 2. I cycle to work through the Park almost every day. I often see cyclists running red lights when pedestrians are crossing. I think it would be great if cyclists could organize to enforce good behavior or, at least, promote a safe culture. Most cyclists are not reckless, but the public mostly notices the ones that are reckless.